Periodontal disease, commonly known as gum disease, affects more than 64 million American adults--nearly 50% of the adult population. 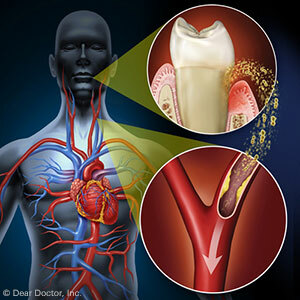 Gum disease ranges from mild, easily treated inflammation to full-blown infections leading to tooth and bone loss. Because periodontal disease is so prevalent, it’s essential to keep up with your regular dental exams so that any signs of infection or inflammation can be treated before the condition becomes serious. Gum disease begins with the formation of dental plaque, a thin film of bacteria that develops over teeth and gums. Plaque is normal and unavoidable, but it needs to be consistently removed through daily oral care and regular dental cleanings. Any plaque that is not removed will eventually harden into tartar, which cannot be removed through brushing alone. Bacteria in tartar can cause inflammation of the gums--a periodontal disease called gingivitis. If gingivitis is not treated early, it can progress into periodontitis. This is a condition in which the gums become so infected that they pull away from the teeth, creating pockets where the bacteria proliferate. The bacteria combined with the body’s immune response cause weakening of the teeth and bones. At this stage you are at risk for tooth loss, bone loss, and other serious health conditions. The existing infection can spread to other areas of the body, while the immune system is already weakened and less able to protect against other invaders. Smoking: Smoking is the biggest risk factor associated with the development of periodontal disease. It also decreases the chances of successful treatment. Age 65 or older: The CDC finds that the percentage of older adults with periodontal disease is even higher than other age groups--a whopping 70%. Hormonal changes: Girls and women are at increased risk of gum disease due to certain hormonal fluctuations. Pregnant women frequently find that their gums are inflamed, and should take extra care with dental hygiene and checkups during this time. Diabetes: People with diabetes are at increased risk of developing infections. Weakened immune system: Anyone whose immune system is compromised from other health conditions are at increased risk of oral infections. With the high prevalence of gum disease in this country, all teens and adults should be vigilant about maintaining dental health. Frequent cleanings and exams will ensure that any signs of gum disease can be treated early, before they progress to more serious health conditions. If you have any of the signs or risk factors above, schedule an exam at Chestnut Dental Associates or call (484) 364 - 4292 today. Your Downington, PA general dentist will help you make sure your gums stay healthy for a lifetime.